This morning year 5 led us in our latest class liturgy which made us reflect on the importance of FASTING. Today is Cafod Family Fast Day and we reflected on the importance of thinking about others during this important time in the church’s calendar. We encouraged everyone to consider what they can either give up during Lent or what they can do that is extra. 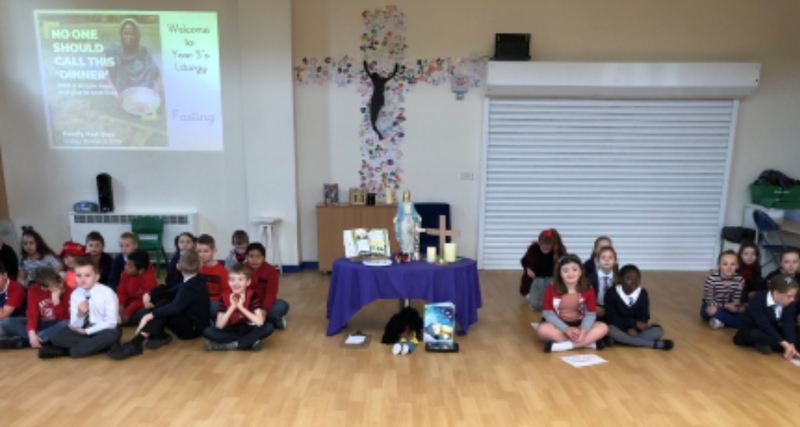 As always this was a beautiful time together and many thanks go to all of the children for their hard work in planning and leading the liturgy.Year 5 led the whole school community in a Lent Liturgy this morning with the focus on fasting.